Dr. Beth Bruening specializes in no-stitch cataract surgery, a same day procedure that replaces the cloudy cataract lens with a clear intraocular lens implant. She has been performing cataract surgery for nearly 25 years, longer than any ophthalmologist in Siouxland. Board-certified in comprehensive ophthalmology; she also has extensive experience in treating patients with glaucoma, macular degeneration, diabetes and all eye disorders. Dr. Bruening has been recognized as a Top 10 Surgeon in the U.S. by Sightpath Medical in 2009, 2010, 2012. A native of Crofton, NE, Dr. Bruening earned her bachelor’s degree in 1983 followed by her medical degree in 1987 from the University of Nebraska. She completed a residency in ophthalmology at Texas Tech University Health and Sciences Center in Lubbock, Texas and relocated to Sioux City to open her practice in 1991. 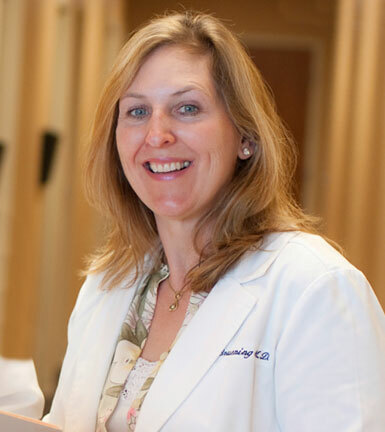 Dr. Bruening joined the Woodbury Medical Society and was elected president by her peers in 1998. She later became president of the Iowa Academy of Ophthalmology. She was selected to participate in the American Academy of Ophthalmology Leadership Development Program in 2004-2005 and then served on the academy’s board and PAC from 2005 to 2008. She also served on the board of directors and several committees of the Iowa Medical Society. Dr. Bruening and her husband, Steve, have two sons.